Don’t be fooled. There’s nothing “One a Day” about these yummy gummies. I don’t like taking pills. Never have, and I doubt I ever will. As a kid, chewable Flintstones vitamins were the solution to the vitamin problem; they tasted funny, but I didn’t mind. At least I didn’t have to down them with a glass of water. I’m not sure how old I was when I stopped taking multivitamins, but one of the reasons I never started taking them again as an adult is because I really didn’t want to wake up to a giant pill every morning, slammed back between mouthfuls of cereal and soy milk. The idea of “gummy” adult multivitamins seems purpose-built for people like me. When I first heard of them – through an ad somewhere, I think – I was intrigued. I only finally got around to picking up a bottle within the last month and a half, so I thought I’d share my thoughts as someone who just recently hopped back on the vitamin train. The Pitch: “Complete ADULT multivitamin.” Each bottle contains 60 gummies. If you believed the product name – One a Day – you’d think that would be enough for two months. But you’d be wrong! The directions clearly state: “For adults and adolescents 14 years and above. Chew two gummies daily.” OK, then. In addition to the stupidity of having the words “ONE A DAY” in giant type on a bottle full of a product that actually requires TWO a day, you’ve just doubled the daily cost of using these. If the name seems misleading, that’s because it is. At $13.49 per 60 gummies, that’s now $13.49 per 30 days, or $0.45 per day. The Look: Nifty green clear-plastic bottle with a child-proof cap. 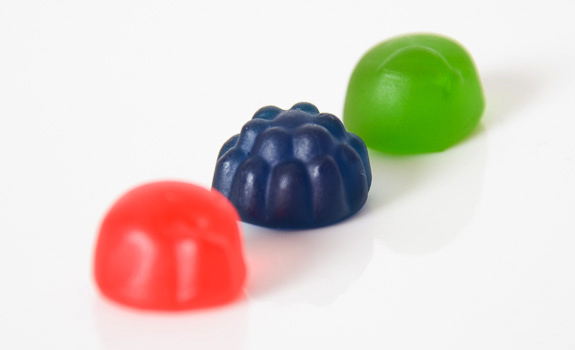 There are three different colours of gummies, and all look like … wait for it … gummies. Yep. Like the ones in the candy aisle at 7-Eleven. Even more reason to keep these well out of reach of the little people in your house. The Taste: Three flavours, all of which are pretty standard. There’s red (tastes like cherry candy), green (tastes like apple candy) and blue (blue raspberry, which tastes like, um, blue raspberries? Whatever. You know what blue raspberry tastes like. There’s also a hint of blackcurrant in there). All have a quality gummy texture that fights back against your teeth. If there’s a vitamin twang to them, it’s slight. 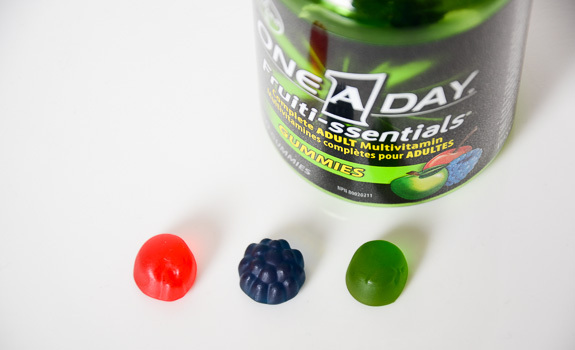 Cherry, Blue Raspberry and Apple flavours of One a Day Fruiti-ssentials Gummies vitamins. If you can’t figure out which one is which, you may be colour blind. Cost: $13.49 for a bottle of 60 gummies at Co-op in Calgary. Value for cash money: As someone who hasn’t been into multivitamins before, these seem absurdly expensive. When compared to other multivitamins, though, they’re only somewhat absurdly expensive. Note that it wasn’t hard to find other gummy multivitamins in 90 packs for roughly the same price. The verdict: They taste fine. If you don’t take other multivitamins, or if you’re not a fan of swallowing large pills on a daily basis, these are a pleasant format to deal with. The only side effect I’ve noticed is that I sort of feel like a man-child when I crack open the bottle every morning. 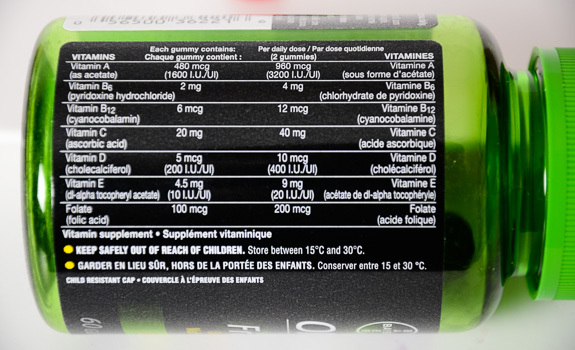 If you’re into the multivitamin nutritional breakdown, here’s the panel on the side of the bottle.